I was whimpering just a few days ago about having to give up on my plant & seed hunting trip to Thailand. I just couldn't make the schedule work, but I need a plant fix, and some warmth. 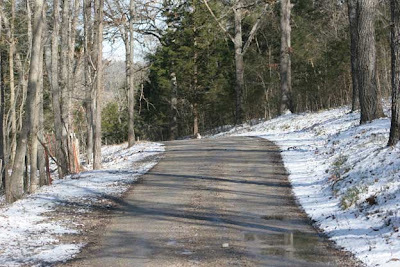 With winter storms predicted, and my dread of more winter, I headed south from the Ozarks on Thursday morning, with the goal of making it to Tampa by Saturday, well ahead of the ice, snow and more cold. 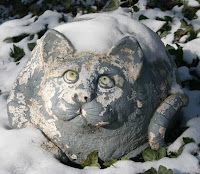 I'd hoped to be bringing you news of some great plant finds and some very cool thrift shop bargains. Funny how life moves. I made it as far as a motel in Germantown, just outside Memphis, Tennessee by Thursday night. My truck transmission was slipping, the storm was fast approaching and I was tired. I thought I would get up early and head on south and east and keep ahead of the blizzard. But morning revealed ice covering everything and the storm had extended down into Mississippi and Alabama, just where I was intending to drive. Pausing in the Comfort Suites Motel lobby to have some coffee, I visited with a couple of the patrons, trying to decide whether to risk the weather, and the ailing truck transmission and try to keep driving. 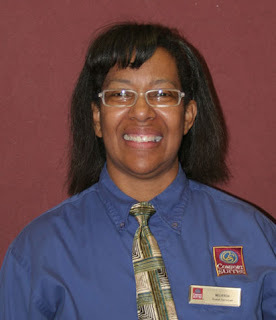 Then I met Melverdia, who works at the motel desk. What she told me had a strong effect on my entire day. Melverdia is a remarkable woman, although I'm certain she is too modest to ever agree. She's had lots of challenges in her life. She retired from working at a prison, certainly a stressful job. She's lost a brother to cancer and agent orange, has grown and changed through her years, with challenges that would flatten many people. So what is it that Melverdia said to me that affected my day so thoroughly? First I have to tell you more about my day, in order to appreciate her words. Picture it, my suitcase full of short sleeved shirts and shorts, sunblock, a listing of plant nurseries and no thoughts of winter, and I'm stranded in an ice and snow storm. Add in the fact the best pickup truck ever, has a transmission problem. And imagine I've just visited the Toyota dealer down the street to learn that it will cost more than $4,000 to fix the problem, but the rebuilt transmission has to come from Ohio, and they're out of stock and won't be able to ship another for at least a week. Imagine, if you will, my 2001 pickup is barely worth twice the cost of the new transmission. Do you see the sands of Florida slipping through my fingers? This could have been a very bad day. Melverdia said to me, "Every day is a good day for me. People come in here and say what a bad day they're having and I tell them there may be challenges to deal with, but that doesn't mean it has to be a bad day. My friends say every day can't be a good day and I tell them it is. I wake up every morning and say to God, thank you for an another day. It's good to be alive." We talked for a good while and I mostly listened. Melverdia certainly wasn't preaching, I had to ask questions to learn abougt her life, but she kindly shared what she had learaned. She said she grew up in a house where her mother had to work hard and could barely feed the family, but through it all, she never had a bad day. She could always smile, could always find something to be thankful for, and always understood that attitude is a choice. You can choose to see life half empty, or you can simply see that it's actually always filling up. Challenges will come and go, you grow stronger and learn form them all, but you can choose to have a good day. So I went out into the storm and tackled the day, knowing the ice will melt, the problems will be solved and somewhere I'll find warm beaches and gardens to visit. Thank you, Melverdia, you showed me how to have a very good day! I believe I have a lifetime love affair with onion rings. I’m not even sure why, or when I first encountered my first onon ring, but it definitely was love at first bite. The perfect onion ring, is crisp on the outside and tender and juicy inside. 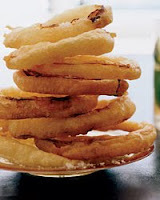 It has to be made fresh - freezing onion rings ruins the texture and the flavor. And those onion “blossoms” that were popular a few years back in restaurants, don’t cut it, either. 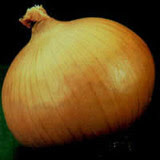 They tend to be overdone on the tips, and gooey and uncooked in the bottom center of the onion. The best onion rings I have ever eaten were at the Pioneer Drive-In Restaurants in Wichita Falls, Texas. At that time there were 6 or 8 P restaurants in that local chain, known lovingly as P-3, P-9, and so on. I was stationed there in the Air Force between 1968 and 1972, and found I could order onion rings to go, keep them in the barracks and have them for breakfast the next day. Really, I did. The good thing about them was, they weren’t greasy, and the crispy coating was still crispy the next morning. I tried numerous times to bribe the waitresses for the recipe and all they would ever tell me was that the secret amounted to 2 things: the onions were soaked in milk overnight, and that the batter included cracker meal. I’ve tried many times over the years to concoct a similar onion ring, without success. I’ve tried making the batter with part cornstarch and flour, including cracker meal. I reject any recipes that contain baking powder, which make a puffy, but not truly crisp ring. I’ve also learned the best liquid to use with the batter is buttermilk. It makes a more crisp-cooking batter than either plain milk or water, which is what a lot of the recipes call for. The best recipe eludes me, but if you have one that is exceptional, and without baking powder and not with bread crumbs, I’d be pleased if you’d share it. Sonic Drive-Ins have had pretty good onion rings over the years. They actually make them fresh everyday. The trouble with Sonic is they cook a lot of onions rings at once, then when they get an order, they dip them in the oil again. What you get is an over-cooked ring, often burned, or the onion inside is just a shadow. One key to a good onion ring, is starting with a mild, sweet onion. Varieties like Walla-Walla, Texas Super Sweet and Vidalia, all have thick rings and very little onion bite. All of those onions will grow in my climate, but to reach their fullest potential, they are at their best if grown where they were developed. A Texas Super Sweet is bred to grow in a Southwestern climate, just like the Walla-Walla is best grown in the Pacific Northwest. Those varieties were developed for those climates. Every year I order my onions from Dixondale Farms, in Texas. I found them on-line because I had become frustrated at the seed companies that will only, “Ship at the proper planting time for your area.” Consistently seed companies think they know more about my region than I do. If I order from them, I’ll only be able to receive my onions, leeks and potatoes, in late March or early April, which is nearly 2 months too late for my region. Dixondale Farms provides a great guide to what onions grow best in your region, and they take the guesswork and mystery out of the Long-Day, Intermediate-Day and Short-Day onion varieties. To solve the early delivery date problem, I found Dixondale Farms were happy to send my onion plants any time of year I want. That means I can get my onions planted in late January. The problem with potatoes is similar, most potato suppliers won’t ship to home gardeners before mid March. If I wait that late to plant potatoes in the Ozarks, I have potato beetles. Planting in early February means I miss the cycle of potato beetles completely! 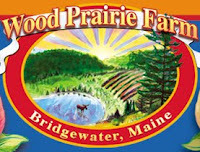 So I order my potatoes from Wood Prairie Farm in Maine. They don’t blink an eye when I say I want to receive my potatoes before the first of February. Wood Prairie is offering something really cool this year and I can’t wait to try it. They have an assortment of best flowering potatoes! It’s called the “Organic Potato Blossom Festival” and is an assortment of 3 mid season varieties of potatoes that are known for their good blooming. Just like any other potato, when the vines die down, you dig up the potato crop. But a bed of potato flowers? I just couldn’t pass that up! So I continue on my quest for the perfect onion ring. Not with a crumb coating, not a tempura battered onion with baking powder, but the equivalent of the Kentucky Fried Chicken extra-crispy coating, on a sweet, tender onion. Suggestions are welcome! And one more bit of news to share. We just received this great picture from our summer intern, from Switzerland, a few years ago. This is Martin Amstutz and his newborn daughter, Lisa. What a proud papa and we're very happy for him. (Several of my relatives will remember Martin at the Harper family reunion I hosted here at the farm about 1998 and how everyone was charmed by him). Snow is falling tonight, it hardly feels like potato and onion planting time, but within a few days, it will be. And Ozarks tradition dictates that peas be planted on Valentine's Day. Spring will come again, we can be sure of it. Happy gardening! This week marks my 4th anniversary with a new kidney. Well, it's not new, my friend, T'ger, gave it to me and he would still be using it had he not been so kind. It's a humbling experience to have someone give you something that can so profoundly change your life. I am grateful every day for his wonderful gift. Thank you T'ger. To keep my body from rejecting T'ger's kidney, I take anti-rejection drugs, and will always do so. Those, too, are lifesaving, yet, there is a downside. One of the drugs has pushed me into Type-2 diabetes, not uncommon for transplant patients. What that means is, the winter holidays are a food challenge. People like to feed me, they bring me wonderful sweets and tempting foods, all of which I normally would enjoy, but have to limit or eliminate completely. My doctor and I decided that since I am a "borderline" diabetic, to attempt to control my sugar levels with diet, exercise and supplements including cinnamon. Getting enough exercise in the winter months isn't easy, not eating the tastier foods isn't either. I've learned that anything white is to be pretty well avoided. Potatoes, bread, rice are all 3 on the "no" list. So are fruit juices, dried fruits, and desserts. Because foods like dry beans, mushrooms of any kind, oatmeal and red wine can easily cause gout - another connection to the kidney thing, I also avoid those. (Sometimes I think the only "safe" food for me is a head of lettuce). I don't care anything about candy or soft drinks, but pie or cake is a weakness. Diabetes is a serious disease, one in which you can lose limbs, lose eyesight, and worse. I know first hand what that is like because we were privileged to take care of our friend, Anne, who was 46 at the time, (and who owned this farm) for the last 2 years of her life. I say privileged, because she was a remarkable woman, a good friend and 3 times ran for President on the Birthday Party, (a story I'll save for another time). During Anne's last 2 years of life, she had a leg amputated, had to go on dialysis 3 times weekly and lost her eyesight. So you can understand why I take diabetes seriously. It's tough for anyone dealing with such things, I know, and the fact I'm a serious foodie and gardener, just makes me whine from time to time. I garden to eat, I cook because I enjoy doing so, therefore, I look for ways to cope with these changes. To that end, I bought a bag of what I thought was the granulated Truvia (processed stevia herb) at Sam's Wholesale Club a few weeks ago. It turned out to be a generic label artificial sweetener in stead of the stevia herb, but I've been experimenting with desserts I can eat in moderation and learning this new ingredient. Sams' also had fresh blackberries and blueberries on sale and I decided to make a pie. Did I say I love pie? My favorites? Cold pie and hot pie. Truthfully I like just about any kind of pie. 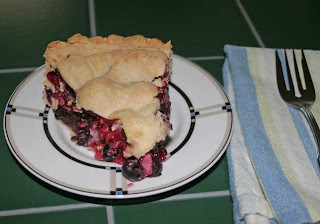 I made the fresh berry pie, and it wasn't bad, using cup for cup of the sweet artificial stuff instead of sugar. But there's a pesky after taste that bothers me. Josh and Barbara couldn't detect it at all (or were possibly being kind), but I could. This week we had a bag of past-their-prime bananas in the kitchen and I felt a craving for banana bread. I typed in, "best ever banana bread recipe" on Google and got a hit. It sounded decent and the blogger promised with exclamation points that it was guaranteed to be the best ever. 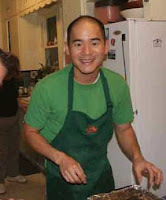 The blogger said it was from America's Test Kitchen t.v. website, which gave me confidence it would be good. I should have questioned the recipe because, instead of calling for, "cream the butter and sugar until fluffy" it simply said to mix those in with the other ingredients. There was a clue I missed that this wasn't the best ever!!! I baked the banana bread and it's ok, but certainly nothing to put exclamation!!! points after. And certainly not an attractive bread, either. The texture would have been improved had I second-guessed the author and creamed the butter and (fake) sugar first. As I was eating a piece of the bread, I realized what I was actually craving was my mother's banana cake, and that I didn't especially even like banana bread. 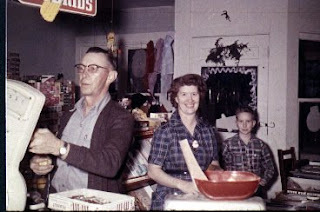 My parents ran a small town grocery store and when bananas went bad, we had to eat them or throw them away. (That's why, to this day, I like green bananas, but can't stomach one when it's turning black around the edges). Mom made banana cake often and it was my favorite way to help get rid of the "rotten" bananas. I went hunting for her old recipe without luck, so I tracked this one down on the web and it sounds somewhat close. Her's was always baked as a sheet cake, was very moist and had lots of bananas and walnuts, and the best part - her great brown sugar icing. 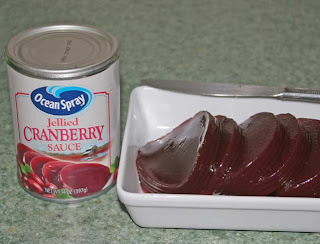 Here's the recipe I found. I don't think there is such thing as artificial brown sugar, so I'll have to omit the icing. Heat the oven to 325 degrees F. Butter and flour a 9 x 16 cake pan. Cream the butter and sugar until fluffy then add the eggs and beat until fluffy. Sift the flour with the baking soda and salt. Combine the milk and mashed bananas in a separate bowl and add to the eggs and butter, alternating with the flour. Beat just until smooth. Pour batter into the cake pan and bake for about 55-60 minutes, or until done. This month the great blue herons are building their nests in the tops of the old sycamore trees along the White River and will be laying eggs in a few weeks. The hellebores in my shade garden are just beginning to bloom and the seed catalog collection is growing larger by the day. Each day that passes is one more day closer to spring. 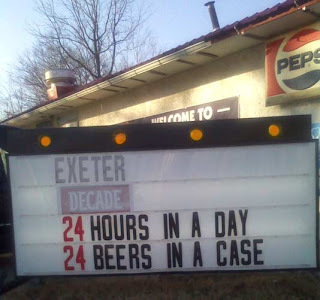 Oh, and here's my favorite just-seen, roadside sign this week. Have a great day. 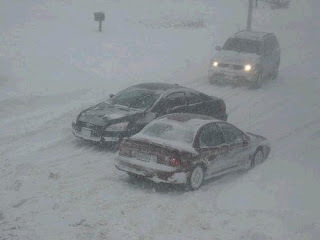 Probably half of the country has been covered with snow since late Dec. Maybe other people like to be out in the snow. I don't. I avoid the cold. But as the temperatures edged upward off the 0 setting, even I venture out to see what's in the fields and woods, with Molly, my dog. I didn't see any snow fleas, but I did post about them on Facebook and at least one gardener challenged me as to whether they were real. Another groaned that, "one more thing to worry about with my dog." Snow fleas are, indeed, real, but they could care less about the family dog. They are harmless little insects, 1/12th inch long that come out at the base of trees and twigs when the ground is covered with snow, and play. They make their living by devouring decaying bacteria, and look, when seen by the naked eye, to be simply, ashes. That's our road that borders our farm, on the left. It's a good road for walks and what you can't quite see in the middle of the road in the far distance, is Molly. She runs ahead, sniffing out interesting things to explore, running on 3 legs. 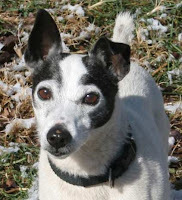 She's a Jack Russell and the leg switching thing is called the Jack Russell skip, a trait that isn't desirable in show dogs. People are always telling us that Molly is limping and I laugh because I know she will use first one back leg, then the other, in this odd skip. Even going up stairs she often uses only her back left, or her back right leg part of the time. But when she's off down the road, she runs almost out of sight, then stops and looks to make sure I'm still following. If I do go as far as I want, and turn around, she'll notice quickly and turn around, also. Unless, of course, she's seen a rabbit and then nothing will deter her for the next several minutes. A reporter contacted me months ago, saying she was writing an article on professions for the March 9 edition of Science Weekly, a publication for grade school kids. She wanted to know if I'd agree to be profiled and if I'd be willing to answer some questions. 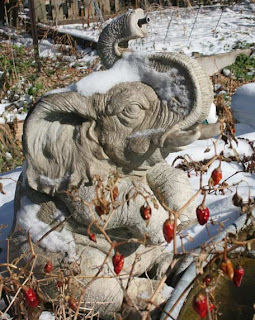 Things like my education background, how I came to have an interest in gardens, in medicinal herbs and things like that. It's meant to give kids an insight into "alternative and different" professionals. Of course I was interested in doing anything that might inspire or encourage kids in continuing their education. But answering the questions created a dilemma, specifically because of who the readers of the publication are. "Can I be totally honest?" I asked the editor. She said I could, and asked why. I explained that I didn't have a traditional diploma, not even a degree from a college at all. "Basically I was bored by school, and hated it," I said. "I always preferred to be outdoors instead of in a classroom." In fact, I explained, every time I got close to getting a degree at the 4 colleges I'd attended, I intentionally changed my major. Back then, I did not want a degree of any sort, I wanted an education. So I spent semesters exploring English composition and literature. I spent more semesters learning public speaking, drama, theater. I got enough industrial design, drafting, interior design, commercial design and graphic arts, to almost graduate with that. Then there was a 4 year tour of duty in the U.S. Air Force where I learned medical illustration and computer skills ar the Medical Service School. "So where did I learn about plants?" the editor inquired. Good question, I thought. Where did I? I always knew plants, from the time I was a child. 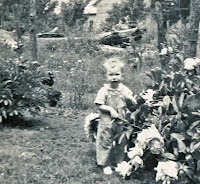 I had my first, tiny garden of my own at age 5. I got a grant when I was still a teenager to study Native American uses of plants on the Taberville Prairie near where I grew up. 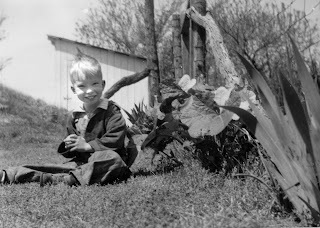 I took hundreds of field trips with the wildfoods author, Billy Joe Tatum, learning to process plants for their uses. I also learned from the herbalist-pharmacist, Jerry Stamps, in Eureka Springs. Basically, I explained, if introduce me to a person and I'll forget their name in seconds, but introduce me to a plant and I'll remember it vividly, many years later. It will be interesting to see what the editor has done with the information in her article. I did stress I think it important for kids to get all of the education they can, to not give up early, to not be distracted. She asked if I had regrets about the path I've followed to get me where I am now, or if I wished I'd finished my degrees. "No, I've never regretted not having a degree. I got the education I wanted and it prepared me completely for what I've done in life." Maybe the article will take the point of view of, What not to do, look where this guy is. But I doubt it, I think she understood that what you choose in life to give purpose, satisfaction and happiness, is valid, no matter how you go about finding it. Do I wish I had taken more plant/botany classes? Certainly, because I've had to learn some of that information on my own. But if I had, I might have spent more years than I did, building landscapes for private homes and estates, which did little to satisfy my connectivity to plants. For me, plants need to do more than look pretty next to a house. They must justify why they are there, by producing food or sustenance of some kind. My herbs do that for me, both the medicinal plants and the 300 or more native and cultivated culinary herbs I grow. Hopefully the kids reading the article will get the point that happiness should always be a part of the equation when choosing directions in life. Oh, and the photos? She wanted some illustrations that show I have always been focused on plants, something to illustrate my passion for plants. I sent the ones you see here, which pretty well shows I started out focused on the garden from the very beginning! Happy gardening. If you think about it, there's always room for at least one tomato plant in your yard this spring! Grow your own, they just taste better. I began my business, Long Creek Herbs, in 1987. 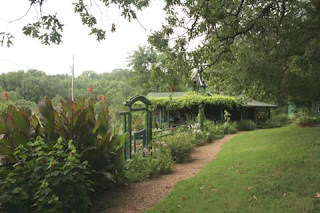 The name is a combination of names: my name is Long, I live on the Long Creek arm of Table Rock Lake, and I grow herbs. I began my business unintentionally. I had been hosting herb and garden clubs for a couple of years for tours in my garden. At the end of the tour, people would often comment, "Jim, this has been wonderful, we've enjoyed the tour (and sometimes refreshments), but we'd like to buy something to take home." I didn't have a clue what they were wanting to buy. At that time I was an out of work landscape architect. I'd had a back injury while working on a garden project for the state of Arkansas, leaving me unable to even sit at my drawing table. Then several important things happened ('85 & '86), that changed my direction in life. I had to lay on my back, staring at the ceiling, trying to decide what to do with my life; without med. insurance and a back injury that left me walking with a walker for a few months, the options were slim. To be occupied in bed, I entered a lot of contests, those kind where you send in postcards. I won a trip for 2 to Colorado, skiiing! Josh and I took the trip, but stopped at his sister, Suzies, where she insisted I "take a tour" of her brand new MacIntosh computer. Nope, I wasn't interested, I wanted a Selectric typewriter and intended to begin a new networking newsletter on herbs, for profit. Suzy (who's a published mystery writer) persisted and I took the 5 minute guided tour. Light bulbs went off, I was hooked. When we came home, I cashed in a small life insurance policy and bought my first Macintosh computer that year, 1987. I began publishing The Ozarks Herbalist newsletter and soon had a lot of subscribers, there wasn't much being written back then about herbs, and no publications devoted to it exclusively. Through that I met some influential and wonderful people who contributed articles and suggestions. About that time, a plant nursery friend suggested I go to the International Herb Growers & Marketers conference in Indianapolis, Indiana. I had no money to travel and owned an ancient and contrary 1976 Gremlin car that I'd scraped up $500 and bought, years before. But the friend persisted in saying I needed to go to this conference. Josh offered me his credit card and connections to people he knew in Indianapolis where I could stay. To the conference I went, with just enough money to get there and hopefully back. I'd even had to borrow money for the conference fees, as I recall. But when I walked into the conference trade show, light bulbs again went off in my brain. Suddenly I saw what the groups had been telling me after their tours. I got it, finally. What they were wanting to buy, were things from my garden, herbal items that would help them remember their visit, products that captured the flavors and fragrances of the refreshments they'd experienced. On the drive home, I mentally built a gift shop, the building you see here. In a few months I scraped together $500 to pay a carpenter to help me, using recycled lumber I had. The following year a friend did the electrical wiring and eventually the Herb Shop was born. Two years later I added an attached building and the bell tower, the building being my packaging and shipping room (which I outgrew in 2 seasons). The publisher of The Herb Companion magazine invited me to take over Tom DeBaggio's Down to Earth column at the beginning of 1992 (something I am honored and humbled by to this day). The publishers at Workman Press, along with my friend, Crescent Dragonwagon, invited me to drive fresh-cut herbs to Washington, D.C. for an Inaugural Brunch Bill & Hillary Clinton. 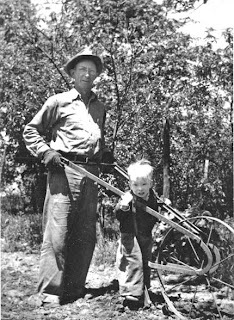 The same year, The Ozarks Mountaineer magazine offered me a regular column, along with syndicating my Ozarks Gardening newspaper columns running in 2 states. During these years I had been publishing The Ozarks Herbalist newsletter, and concocting new formulas and recipes. I'd enlarged and improved the herb and vegetable gardens and was having more and more visitors. After 7 years, I ceased publishing my newsletter. I not only joined the International Herb Growers, which was a large organization back then, but wound up on the board of directors, which is when I was asked to develop the Herb of the Year project (something that is still on-going, chaired by my friend, Chuck Voigt at the Univ. of IL; check my blog for this year's herb - dill). That project furnishes information and recipes/uses to many organizations and businesses for a designated herb each year. 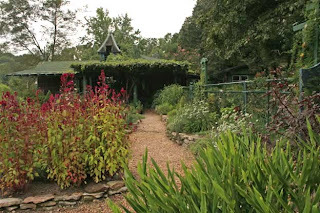 When I ceased publishing The Ozarks Herbalist, I turned my attention to writing my "Great Little Herb Books." I found a method whereby my lectures to groups, flower & garden shows, etc., could be turned into marketable books, using the same time and resources I'd spent putting out an issue of the newsletter. That method continues and I have 28 books to my name, most of them published by Long Creek Herbs (and some out of print). Three of them are through Storey Books, a division of Workman Press. Those 3 books gave me entrance to a wide variety of television appearances, not just local media around the country, but several HGTV and Discovery programs. It also produced a flurry of magazine articles focusing on the garden and I've been featured in most every national magazine, for which I am grateful. During those years I developed my own formulas for dream pillows and writing 3 books on the subject, and those continue to be successful for me and fun for our customers (read my Dream Pillows blog for stories of how Dream Pillows have helped people). And, having developed athlete's foot and cracking heel, I concocted a formula that has become my Herbal Nail Fungus Soak, which we sell nationwide and abroad through pharmacies, whole foods stores, chiropractors, podiatrists and even a few doctors. At the base of my business are these principles: 1 - Our work has to be enjoyable. Why spend your life doing something you don't like? 2 - We are dedicated to developing an appreciation for herbs, both culinary and medicinal and (3) We offer great customer service, believing it's important to treat others as we would like to be treated. So, there you have it, the short (yes really) version of our evolution. Not included is the story of how we found this place, of the wonderful woman, Anne, who left it to us, and a lot of other important people and stories, too). Thanks for asking and caring enough to read it. Happy gardening! Like lots of people, I'm spending New Year's weekend thinking about the good and not so good things of the past year. That prompted me to look at products and suppliers of our company this year. In case you aren't familiar with what we do here besides the garden, we manufacture and sell my herb formulas and herb cookbooks through our website and catalog. Our products are all based on herbs and plants, and some, like Herbal Nail Fungus Soak, are healing; others, like our Roaster Seasoning, give flavor and taste to meals. My Dream Pillows and Dream Pillow blends give pleasant, peaceful sleep. We ship our products all around the world and it is very satisfying to know that people's lives (and toes and fingers) are better because of what we create here. We recycle, we live lightly on the land and we take pride in what we offer our customers. For my rant, I'm going to mention a box company, and it relates to my garden and to yours, too., no matter where you live. This company gets my "award" this year for being the most detrimental to the environment of any of our suppliers in 2009. 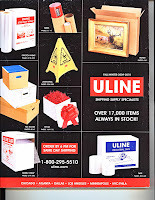 This company, Uline, makes great shipping boxes and we are grateful for their good service and helpful personnel. However, they get the award, from me, for being our least green supplier of the year. Why? Uline sends us between 30 and 50 catalogs a year. One in each order, one to our billing address, one to our shipping address and one a month, regardless. 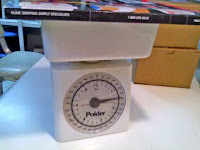 This is important for 2 reasons: 1 - The catalog weighs one and one half pounds! That amounts to between 45 and 75 pounds of paper that is unnecessary. And, 2 - because there is no "opt-out" option. We've requested to be sent just one catalog a year, which would be ample, but the company tells us they can't do that. Other companies who order from Uline have also complained, according to our UPS and FedEx drivers. So, for the least green supplier we have this year, the "Boooo-Bad for the Environment" award goes to Uline. We recycle their catalogs but, how thoughtless of them to waste such resources. With thousands of customers, that's a lot of trees cut down that are totally wasted. No one can use 50 catalogs a year, no matter how big the company is! (And if you'd like to tell them they got the Booooo-Bad for the Environment award this year, or to complain that they are unnecessarily filling the landfills with their wasteful catalog mailing practices, here's the "Contact us" link: http://www.uline.com/CustomerService/ContactUs_menu.aspx). Fortunately we have some wonderful suppliers who do care about the environment with what they produce. Lavender Lane comes to mind. They don't have a paper catalog, all of their products are on-line. They've been supplying bottles, jars, packages, oils and special kits for many years. I first met and got acquainted with the owner, Donna, at an herb conference almost two decades ago. 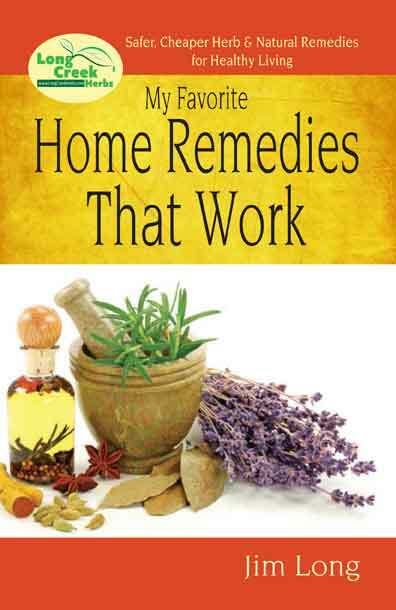 I list them in the Sources section of many of my herb books for folks who are in herb-related businesses, simply because Lavender Lane will sell you just one bottle, or a thousand. Thanks, Lavender Lane, we appreciate what you do! Evening Shade Farms, the nice folks who make our bug-repelling soaps for us, along with other specialty products, are just great folks to know. They have a simple, recyclable catalog, sent out once a year, with a website and fast, personal service. They care about the environment as much as we do. 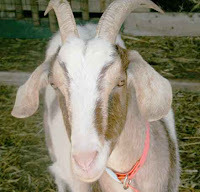 They use their own organically grown herbs and their own goats milk in their soap. 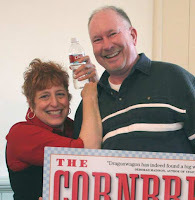 I first met the owner, Gayl Bousman, at a Small Farm Conference, again almost two decades ago. Check out their website and if you ask for a catalog, Gayl won't send you pound and half catalog 30 times a year, I promise! (They sell both retail and wholesale). And the folks at The HerbPharm are also fantastic to work with. I first met "Herbal Ed" Smith, the founder, at an International Herb Association conference back in the late '80s. He was presenting a program about marketing, both the ethics of what you produce and how it effects people, along with how to price and market what you make. I credit Herbal Ed for opening my eyes to the philosophies of ethical marketing. Their company supplies us with Spilanthes-Usnea Tincture, which we sell as an additional product to our Herbal Nail Fungus Soak, for people with especially difficult nail fungus. (You probably know, any gardener who digs in the ground, eventually will encounter nail fungus). So, to Herbal Ed and all the folks at The HerbPharm, thank you for the outstanding service this year. So there's my rants and kudos to wrap up the year. Rants about companies that ignore their customers, against companies that could actually do something for the environment in a substantial way but instead continue to produce millions of pounds of over-sized catalogs, wasting resources and filling landfills unnecessarily. And kudos to companies like The HerbPharm, Lavender Lane and Evening Shade Farms, that care about the environment and conduct their businesses in ethical, sustainable ways. Here's to a better year ahead for each and everyone who read this blog. Thank you, I appreciate you all!